This was something we had always wanted to do, to celebrate New Year’s Eve at Cameron Corner. Many people may not even know where Cameron Corner is, so let me explain so that you know why this was such a unique experience. Our little lizard friend we tried to save from the middle of the road, he was not a happy little boy! Cameron Corner is located at the border of NSW, SA & QLD. This unique location means that you can celebrate New Years Eve three times due to the differing time zones, how cool is that! So while everyone else around the country celebrated once, we welcomed in 2015 THREE times! Our journey started on boxing day as we headed out to Dubbo and then on to White Cliffs, Broken Hill & Silverton, Tibooburra, Cameron Corner, Bourke & Lightning Ridge. We were travelling with a group of 3 cars, 6 adults and 2 children – all of which, except us, had never done any outback travel, so everyone was excited about what lay ahead. After a few days of exploring the surrounding areas, 31st December had arrived and we were off to Cameron Corner. We left Tibooburra early for the relatively short drive to Cameron Corner, we wanted to arrive early and set up camp before it got too hot. The roads during that part of our journey were more red and sandy than the previous days as we headed closer to the Strzlecki Desert. 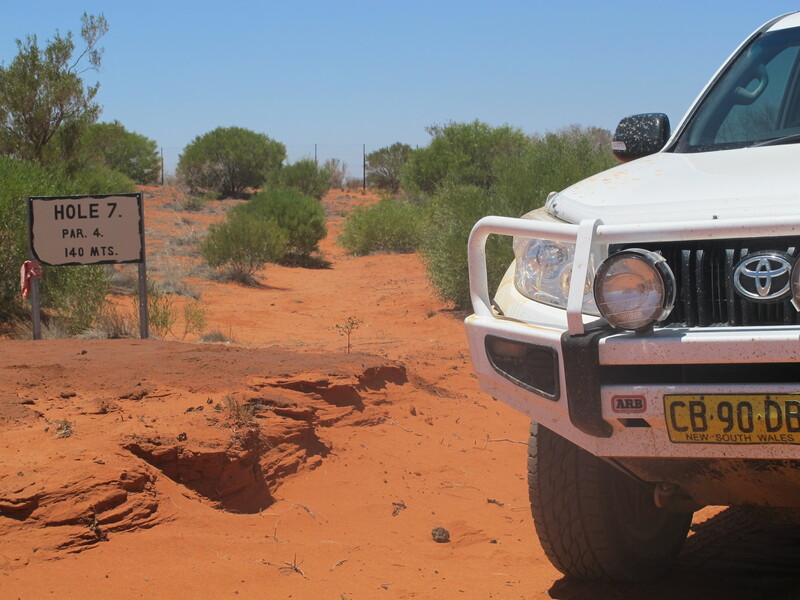 We drove through the Sturt National Park and along the dog fence, passing through the dog fence at Cameron Corner. We arrived at Cameron Corner around 11am (but gained an hour as the store is located in Qld so it was only l0am!). We arrived and went to the corner store to pay for our camping and have a quick drink at the bar. Camping was $10 per night, with $5 of that going to the Royal Flying Doctors Service. With the $5, they rolled it up with a tack in it and you have to throw it up for it to stick on the roof! Believe me, this is not as easy as it sounds …… although the owners make it look easy! After setting up camp we went for a drive around the property and then took a drive back to Fort Grey campground and had some lunch there. We then headed back to Cameron Corner via the Queensland side and the Fortville Gate. You can even play a game of golf while at Cameron Corner, as you cross over the borders in the three states! Another pretty unique experience, but it was a little too hot for us to undertake on this visit! It was nice to be in the air conditioning of the car as the temperatures were in the mid 40’s (it was 31 degrees at 9.30am!). Yes it was hot, but the temperatures were a lot lower than what we were expecting and had prepared for. We had been told to expect around 50 degrees at that time of year, so we were very lucky. Also there was a slight breeze which helped, especially at night. After lunch we drove through an area which was completely filled with kangaroos and lots of babies aswell. Some of these guys were huge and although we have seen so many kangaroos the last few days, we haven’t seen this many together. When we got back to camp, we were talking to the store owners and they said that there is absolutely no water around and most of these poor guys will be dead in the next few months. Guess that’s the sad reality of outback life, really made you think. So by early afternoon we were back at camp and the area was starting to fill up, with more people still arriving. We had camped in the non-powered side, so we were all fairly spread out, but the powered area on the opposite side of the store was pretty full. The festivities started in the early afternoon with games of horse shoe toss, mini golf etc. We took a wander around and met some of the other campers, even met some from a few suburbs away from us! Everyone was in party mode, there was music and laughter all around, while people wandered around the camp sharing a drink and a chat with each other. The real party started around 10.30pm (or 11.30 pm Sydney time). Everyone started to make their way up to the ‘corner post’ where the owners had set up tables, chairs and music. We all headed up with drinks, glow sticks and sparklers! The ground was marked with lines in the sand so we all knew which ‘state’ we had to be in! The first celebration was in NSW, we had the countdown and then everyone celebrated with each other as we brought in the new year! We then waited for our next countdown! 1/2 hour later we all walked over to South Australia and had yet another countdown and celebration! And when I say we ‘walked to South Australia’, I mean we literally walked about 1 meter and crossed over the marked line in the sand! There was plenty of music, singing, drinking and laughs to fill in the time in between. Finally it was Queensland’s turn, so we all jumped over the line in the sand into Queensland for our final New Year’s Eve celebrations for 2014. The celebration was was finished off with a small fireworks display, not quite Sydney harbour standard, but we’d never seen fireworks in the middle of the outback before! What a fun night. The owners sure know how to make this a fun and unique experience! We were all in bed around 2am and up again at 6.30am to pack up camp! Not a great deal of sleep ….. the music blaring and talking, laughing and screaming all night didn’t help things either, but hey it was New Year’s Eve so what do you expect!! Must say that things were a lot quieter in the morning! George standing in SA and Shelly standing in NSW! What a great night, such a unique experience and such a great bunch of people. We estimate there would have been around 70 people there. We will definitely be back again! It’s one of those things we are glad we could tick off our bucket list, highly recommend people experience this at least once in their lifetime! This entry was posted in 4WD, Cameron Corner and tagged 4WD, 4WD adventures, cameron corner, cameron corner store, new year, new years eve, NYE, NYE 2014, NYE at Cameron Corner, unique by Off The Track 4x4. Bookmark the permalink.